What exactly is Google Possum? Basically, Google uses an algorithmic to crawl through different businesses when a person does a Google search. Google, periodically updates this search Algorithm. And Google has just recently announced an update to their search algorithm. The search engine company calls this newer and updated algorithm, Possum. Most of those affected by this Google Possum updates are the local businesses. So if you run a local business, then you should know that there are some drastic changes to how Google indexes your business in their search engines. 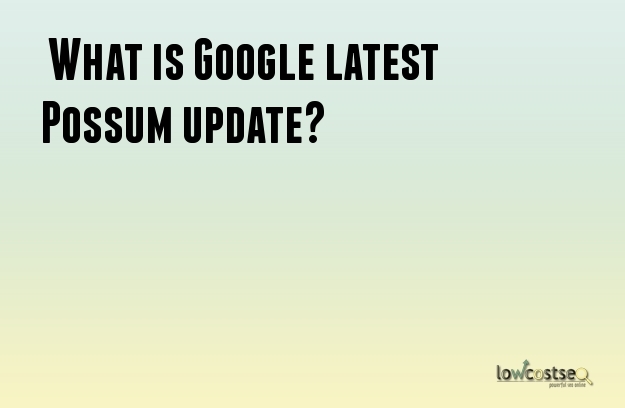 What exactly are the changes for this new Google Possum Update? The first thing you should note with Google's new Possum update is the precedence of the location filter in searches. The affiliation and location are now taken into account with search engine crawls. This new location filter now means that even businesses outside of a city's limits have seen a huge increase in search ranking hits. So even if your business technically sits outside a city area, as long as it is nearby that city, it should appear on search engine rankings. This could negatively affect some businesses because Google is now actively filtering out businesses that have the same affiliation. For example, if a business is affiliated with several names, then Google will just show the highest rank named affiliated with that business. So if you have several names affiliated with one location, then you could be impacted by this. The location of the person using the search engine is now also taken into account in search rankings. For example, if a user is nearer to your business, then your business' website will be ranked higher in search hits. However, the farther away your business is from the user, the lower your search ranking will be. This real-time account of a user's location could affect your search ranking in a lot of ways. This means that location is very important for search rankings. If you are located in the middle of the city, or a busy area, then you will have a high search ranking for a lot of users in that area. Conversely, if you live far away from population centres, you could see a drop in your search ranking. The variations of keyword searches did not seem to affect previous Google searches, but with the latest update, it now does. This means that even slight changes to keyword searches could yield different results. If you want to increase your search ranking in this new Google update, then you will have to include as many keywords as possible with your website, in order to be ranked higher. If your business has a local market, your will definitely see an improvement in search engine ranking. This is because, with the new Possum update, there is a wider difference in both organic and local searches, leading to an increase in traffic for businesses with a local market.